Arrested Development, the Grammy Award winning band with Atlanta roots, capped off Tech Square Innovation Week with a performance in the Centergy Courtyard. Hundreds of entrepreneurs, investors and technology enthusiasts descended upon Midtown the week of May 7, 2018 for the inaugural Tech Square Innovation Week. 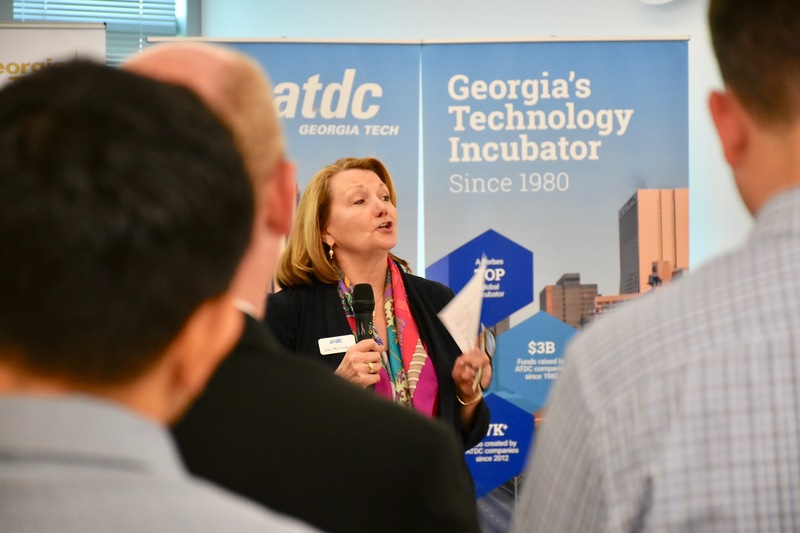 The week, which featured more than a dozen events, including the Advanced Technology Development Center’s 2018 ATDC Startup Showcase, was designed to highlight the innovation and collaboration occurring in and around Tech Square. Hosted by Georgia Tech’s Enterprise Innovation Institute (EI2) and ATDC, Tech Square Innovation Week brought the spotlight to the different programs and resources that have converged to make Tech Square a national model of an ecosystem where business and industry, startup entrepreneurs, students, and the investment communities grow, succeed, and thrive. The week included more than a dozen events ranging from FinTech South and the Atlanta Startup Battle, to the Georgia Tech Innovation Showcase and the ATDC Startup Showcase. It also included a visit from Ga. Lt. Gov. 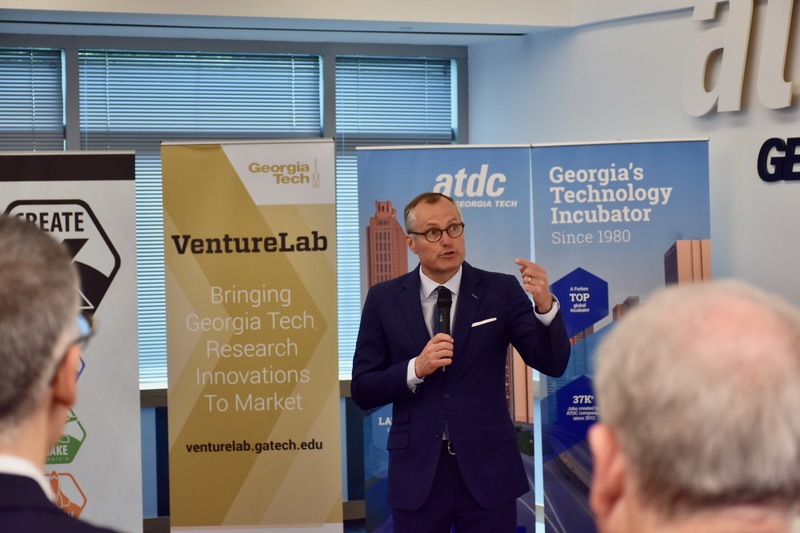 Casey Cagle to ATDC to mark a milestone in the incubator’s expansion and reach. “Tech Square has come a long way in the past 15 years, but in many ways I think we are just getting started,” said Chris Downing, vice president and director of EI2, noting the Tech Square concept was launched in 2003. See photos from the 2018 ATDC Startup Showcase and the Georgia Tech Innovation Showcase at our Facebook photo gallery. In a 2016 visit to the Advanced Technology Development Center (ATDC), Georgia Lt. 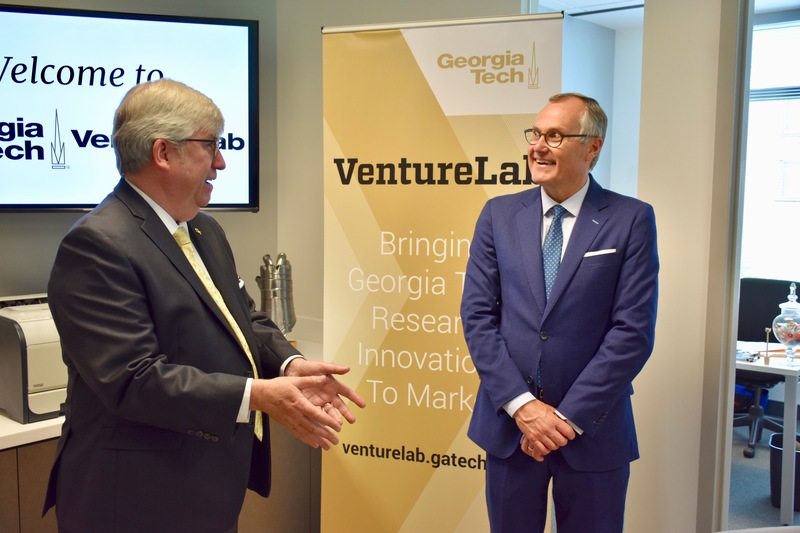 Governor Casey Cagle challenged the state’s tech startup incubator to double the number of resident startups it served in Atlanta and the rest of the state. Two years later, ATDC — a program of the Georgia Institute of Technology — not only met the challenge, but has exceeded initial expectations, with more than 180 companies now in its Signature and Accelerate portfolios across the state. 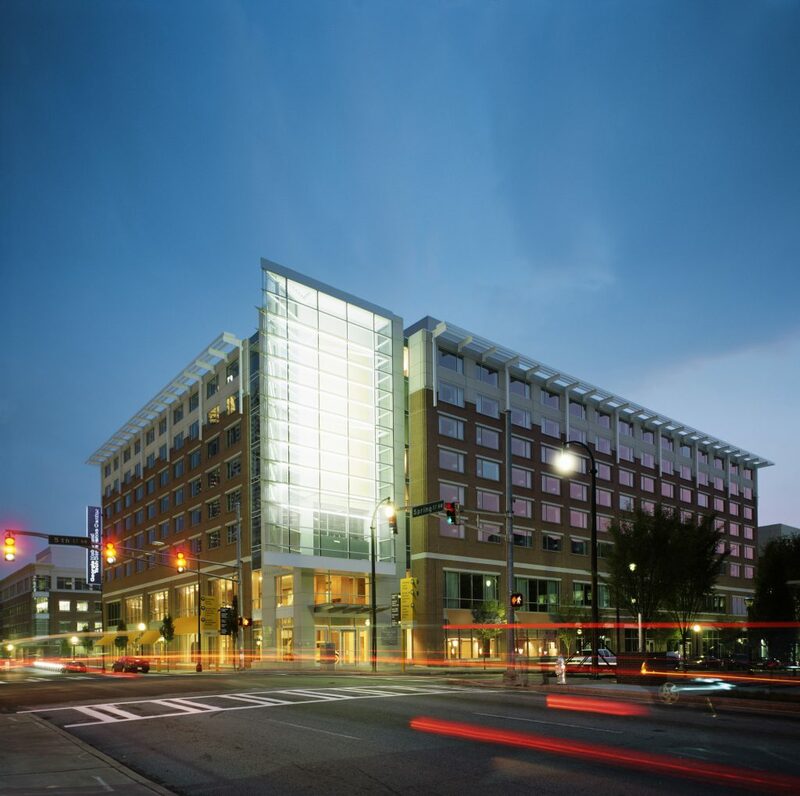 The growth has led to an expansion of ATDC’s offices in Technology Square to accommodate that demand. The creation of new suites at ATDC’s second floor offices in the Centergy Building — and expansion onto the third floor — allows for the incubator to house an additional 25 resident startups. Cagle was on the Tech campus in a May 8 reception to mark the milestone, visit with some ATDC startup company CEOs, get an update on the Engage venture fund and growth accelerator, and to learn more about the innovation ecosystem that also includes the Institute’s VentureLab, CREATE-X, and Flashpoint programs. His visit was part of a weeklong series of events taking place during Tech Square Innovation Week, which celebrated Tech Square as a hub of ideation. The expansion underscores the explosion of demand for ATDC’s services not only in Atlanta, but across the state, including Athens, Augusta, and Savannah. “We were able to meet that demand in part because we received an increase in state funding — thanks to Lt. 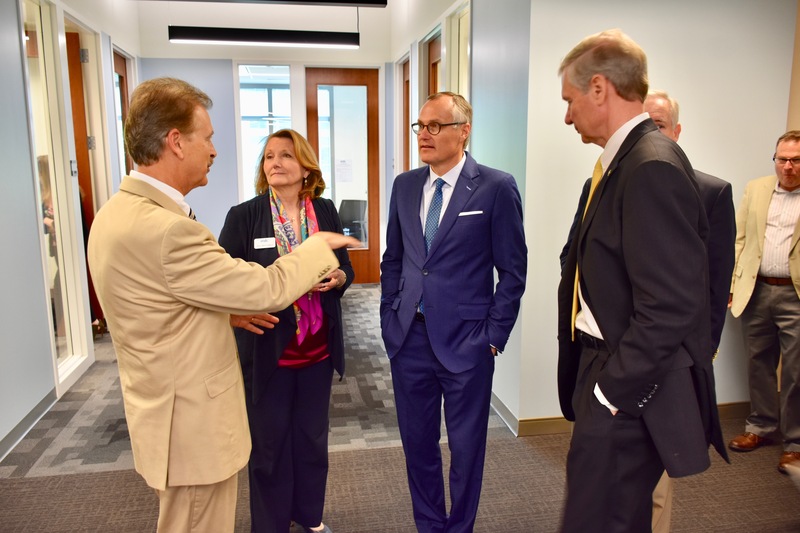 Governor Cagle’s leadership — that allowed us to increase our services and statewide reach,” said Chris Downing, vice president of the Enterprise Innovation Institute, Tech’s economic development arm whose programs include ATDC. In 2017, ATDC’s portfolio companies raised $130 million in investment capital and in the in the first quarter of 2018, they attracted more than $33 million in investment dollars to the state. Georgia Tech President G.P. “Bud” Peterson, who welcomed Cagle to campus, said ATDC’s success is just one of the many successful components in the Institute’s technology startup support. Other programs include CREATE-X, a faculty-led initiative that helps students pursue entrepreneurial opportunities. VentureLab collaborates with Institute faculty and students to create startups based on Tech research. Flashpoint is a startup accelerator, and Engage is an independent, early-stage venture fund and growth program. The additional office spaces will allow for greater collaboration and partnership between ATDC, VentureLab and CREATE-X. “This success all around Tech Square has been possible largely due to state support, and the lieutenant governor’s vision for fostering innovation in the state,” Peterson said. 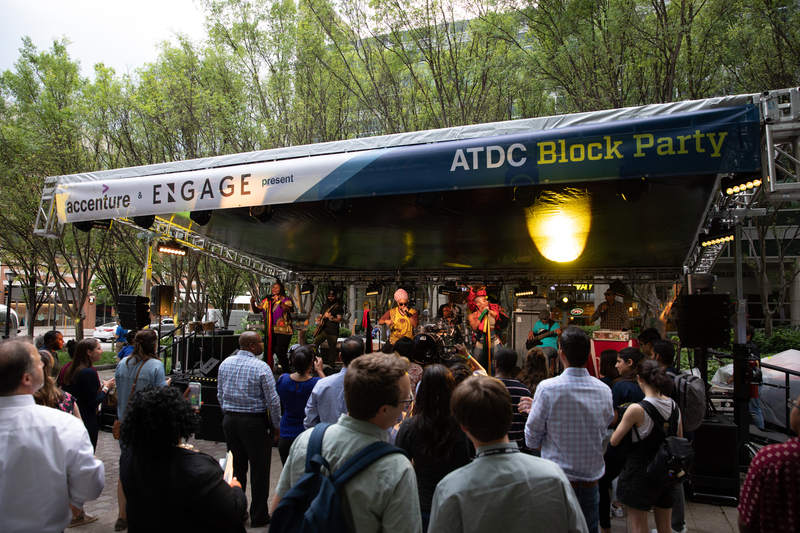 Weeklong events from May 7-10 to shine spotlight on innovation ecosystem and feature open houses, tech summits, block party and 32nd annual ATDC Startup Showcase. 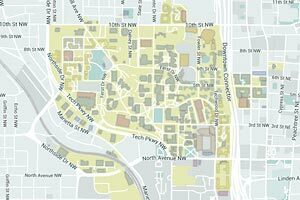 The area around the intersection of Spring and 5th streets is a hotbed of technology startups, research, and economic development. Now in its 32nd year, the ATDC Startup Showcase is Georgia’s largest spring startup confab. The event, which draws nearly 1,000 attendees, features more than 80 of disruptive technology companies from the state of Georgia.